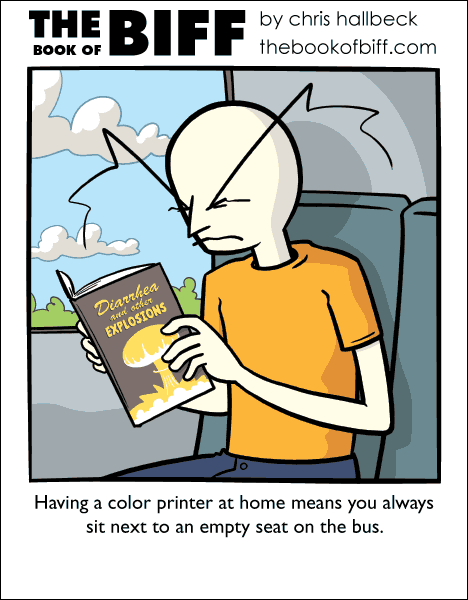 I used to read a lot of books on the bus. I remember at first being self conscious about people seeing what I was reading. After awhile I realized nobody cares. They just want to get on with their lives. Reading a book probably attracts attention now because “Whoa! Someone reading a physically printed book!” All the kids with their electronic books and internet telephones now. I still read books, I hate the electronic books. If I must read, Then I must feel the pages. My classmates look at me like I’m crazy…. for two reasons: 1)The majority of them don’t read, even if it’s for a class, 2) if they do read, the do it Electronically…. I do most of my reading on an Amazon Kindle. That way, I can read books during my commute that would otherwise be way too big to carry around (currently reading Peter F. Hamilton’s “Night’s Dawn Trilogy”; each part is around 1200 pages), but since it’s an e-Ink display it looks exactly the same as paper so there’s no eyestrain. The sheer impracticality of lugging around the kind of books I read made me an early adopter of e-books, even back before e-Ink devices existed. Admittedly, reading books on a Pocket PC with a regular high-DPI backlit LCD display was a bit of an eyestrain, but still better than having to deal with big, heavy books. And with e-Ink, I no longer miss real books at all. yeah, I still prefer physical books. However, I must admit I’m probably at least slightly insane. I choose books in part based upon the smell of the glue used in the bindings. I consider myself something of a connoisseur of book glue. It’s the finer points of book ownership that this new, digital generation is missing out on. In school, they taught me *not* to sniff glue. I still read physical books, because I just can’t see any reason to buy a tablet or e-reader of any kind. What would I use it for, when I already have a computer, and physical books? And we have lots of books, so it would probably take a lifetime for me to finish reading the ones we already have, if I don’t start reading way more or faster. Interesting book cover, by the way! Maybe I should start printing new covers for my books and read them when I am at some place where people can see me, instead of just reading as a way for me to fall asleep easier at night? I prefer digital books ALMOST all the time, but I do still keep physical copies of a few dear old friends around. The books that have sentimental value, as well as just being a good read. You don’t get the same satisfaction of bonking somebody over the head with a Device that you do with the Collected Works Of Shakespeare hardcover. I personally read my books on my e-reader; but I still buy paper books (preferably hardback instead of paperback) because I want to be one of those people that hoards them when we finally reach the stage of life seen in Farenheit 451. At that time, I want my house to be the one that goes up in the highest ball of flame when they catch me with my massive collection. I think the apartment complex will be upset with the situation at the time, though. In California having a brief case while reading American Handgunner on the bus means no one bothers you. Does he or doesn’t he? Only his armorer knows fer shure, fer shure! I’m gonna have to gin up some Odd covers for the library books I bring; Google here I come! I generally fly and read, but once I thought… It will be a long flight, why not play some video games? I packed joystick, and loaded up a new challenge…. I couldn’t figure out why the lady sitting next to me kept acting more and more nervous: Oh! Don’t crash 57 times on take-off just because that’s the hardest part of your new flight sim…..